Being a native of St Louis, I vaguely remember hearing about a boy that fell through the ice and survived miraculously. But I never really followed through on all the details of the story until the movie was being filmed based on the book The Impossible by the mother of the boy, Joyce Smith. The film, Breakthrough, would retell this mother’s anguish but most especially her extraordinary faith that literally moved mountains for her son. Produced by DeVon Franklin and directed by Roxann Dawson for 20thCentury Fox and distributed by Walt Disney Studios, this movie is a testimony to the power of prayer and grace working through peace. The film details the story of John Smith (Marcel Ruiz), a typical 14-year-old boy in Lake St Louis, Missouri, adopted by his parents as a baby and brought up in the suburbs. He and his friends go on a weekend trip with one of the boys’ family during the winter and they end up playing near Lake Ste. Louise, a lake frozen over but with hints of Spring melting away the chill. The ice cracks beneath them and the three boys all fall in. From the shore, a man sees the incident and calls 911. Immediately the two boys are pulled from the icy lake waters, but John is nowhere to be found. One of the first responders, Tommy Shine (Mike Colter), an agnostic, hears a voice call to him to “go back.” As he pokes with his poll to the lake bottom, he turns back to where the lake bed drops deeper, he finds John and they quickly pull him to shore. Unable to revive him he is rushed to St. Joseph’s Hospital where he remains unconscious. His mother, Joyce (Chrissy Metz) arrived at the hospital just as the doctors were about to call the time of his death. Joyce refuses to believe that John is dead and prays incessantly that the Lord breathe life back into her son as the technician keeps administering CPR. John’s heart miraculously starts pumping after more than an hour. In a flurry of activity he is airlifted to Cardinal Glennon Hospital in St. Louis, a world-renowned hospital for children. Joyce and her husband Brian (Josh Lucas) follow by car. Once at Cardinal Glennon, Dr. Garrett (Dennis Haysbert), an international drowning expert, held out little hope for John who was showing no signs of brain activity and whose body was in full hypothermia. The odds were 99 percent against his survival even after his heart starting pumping. His body was completely shut down and his lungs were in catastrophic failure. But, Joyce refused to believe that John was not going to make it. 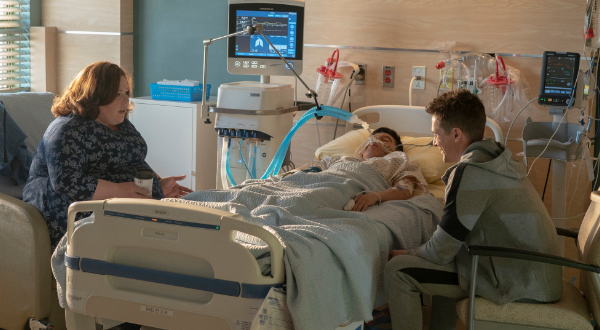 The youth pastor from their church, Pastor Jason Noble (Topher Grace), came to be with Joyce and Brian at the hospital. Brian simply could not bear to see his son in that condition that he stayed in the waiting room, as Pastor Jason and Joyce prayed with trust and faith for John’s healing. L to R: Chrissy Metz (Joyce Smith), Marcel Ruiz (John Smith, in bed) and Topher Grace (Pastor Jason Noble) star in Twentieth Century Fox’s BREAKTHROUGH. Photo credit: Allen Fraser. As the hours turned into days, Joyce would not leave John’s side. Little signs of hope were apparent as John would shed a tear or thrash about when nurses or doctors poked him. They said it was just normal body reflex but not necessarily a sign of brain activity. Yet, what Joyce and Pastor Jason saw were more than just reflexes. They were seeing God’s miraculous powers at work. John was fighting to live and God was showing his grace at work. One of the most striking parts of the film for me was when Chrissy Metz as Joyce goes before the hospital personnel and into the waiting room where friends, family, and church members were gathered and calls them all out about the spirit of chaos and unbelief. When Joyce heard somebody speak negatively about John saying that he is not going to make it or “What a shame!” she responds that only positive words are to be spoken in John’s midst and about him. Often when medical personnel said anything negative in John’s midst he would thrash about and his body would go into convulsions. She insisted that only positive words are to be spoken and prayers offered. Only with a atmosphere of peace would John’s body be able to heal and God’s grace take over. The Evil One works through chaos and lack of faith. Joyce would have none of that. Truly in our spiritual lives the Evil One works through all types of situations and incidents to shake our faith and disrupt our trust in God. He will stop at nothing to get us to doubt that God is more powerful than anything and bigger than any seemingly impossible situation. This is why trust is such a struggle. It’s rather a simple spiritual maxim but with such extraordinary consequences. When we let go in trust, and believe that God is God and hears our concerns, prays, and desires, we can be confident that he will answer them in his way and in his time. Yet, always it is a call for trust that comes out of peaceful surrender. Peace is a sign of the Holy Spirit, chaos a sign of the Evil One. Joyce believed in the Lord’s promise to be with her and with John even when all hope seems lost. It was her prayer in peace that allowed God to work his healing miracle upon John. And that’s how he works miracles in our lives. And miracles do happen! This story proves it. 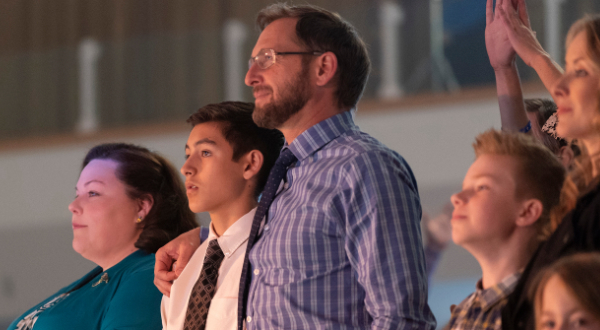 L-R: Chrissy Metz (Joyce Smith), Marcel Ruiz (John Smith), and Josh Lucas (Brian Smith) star in Twentieth Century Fox’s BREAKTHROUGH. Photo credit: Allen Fraser. TM & © 2018 Twentieth Century Fox Film Corporation. All Rights Reserved. Not for sale or duplication. John miraculously recovers, completely and without any after effects. When everyone said he would at the very most be brain damaged and a vegetable, here John lives to this day a healthy young man full of dreams and ambitions. God cannot refuse the pray of a mother for her son. Just look at the Gospel of Luke when Jesus meets the widow of Nain who mourns the death of her only son. Jesus feels her pain and takes pity on her by restoring her son to life. And with a mother as fiercely protective of her son as Joyce was of John, no one would dare stand in her way when she believed John would not only survive but be restored. The Lord heard her cries and gave her son the gift of life. A beautiful testimony to faith and the effects of a peaceful and surrendered prayer. God delights in our trust and only asks for more of it, something that requires constant practice and abundant prayer. 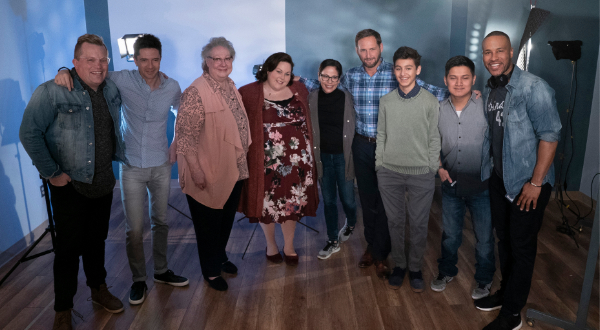 L to R: Pastor Jason Noble, Topher Grace, Joyce Smith, Chrissy Metz, Roxann Dawson, Josh Lucas, Marcel Ruiz, John Smith and DeVon Franklin on the set of Twentieth Century Fox’s BREAKTHROUGH. Photo credit: Allen Fraser.